« Be A Real Life Hacker! But I’m sure there are people out there who would part with a whopping â‚¬15,000 ($19,930)!! 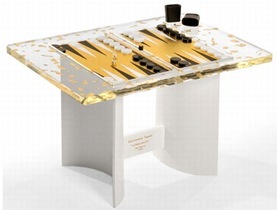 This luxury backgammon, designed by Backgammon enthusiast Emmanuel David, it measures 900 x 600 x 600 and features gold leaves. The gold leaves are fixed into the transparent surface of the coffee table. Also, there’s only four copies! This entry was posted on Monday, May 4th, 2009 at 9:26 pm	and is filed under Shopping. You can follow any responses to this entry through the RSS 2.0 feed. You can skip to the end and leave a response. Pinging is currently not allowed.